Not Just Another Mother Blogger! : Explorers Ahoy! Zane and I went to the park this morning! It was nice and cool, with a bit of a breeze. We walked through the middle of the park, venturing off the walking path to climb on rocks and sticks and creepy-crawlies. Boys can't go exploring without looking for a big stick. It's a rule or something. 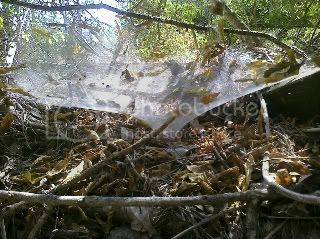 This is the web of a funnel web weaver spider. They build their webs on the ground and hide inside their 'funnels'. 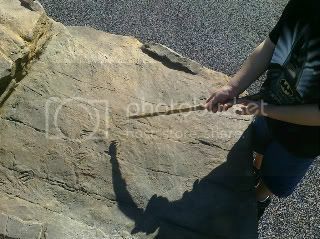 We found some fake dinosaur tracks to poke with the previously mentioned stick. 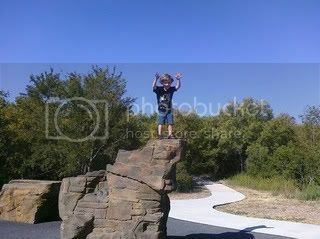 There were 'huge-big' rocks for little boys to climb on, and Zane had tons of fun climbing to the top. "I'm king of the world, Mom!" I sometimes forget how much I like to walk through parks, exploring. It's nice that I have Zane to go exploring with me. 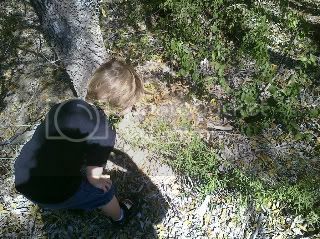 I hope we find a snake next week! What a fun park! 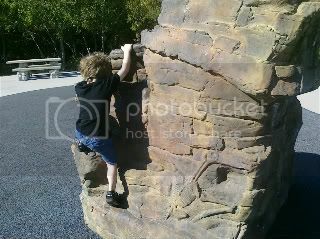 The city my in-laws live in have one of those climbing, mulit-level parks... the kids and I love to go play there when we visit. And yes, sticks and little boys go together! WOW! I have never seen, or even heard of, a funnel spider before...creepy crawlie indeed! Love his Kingof the World!